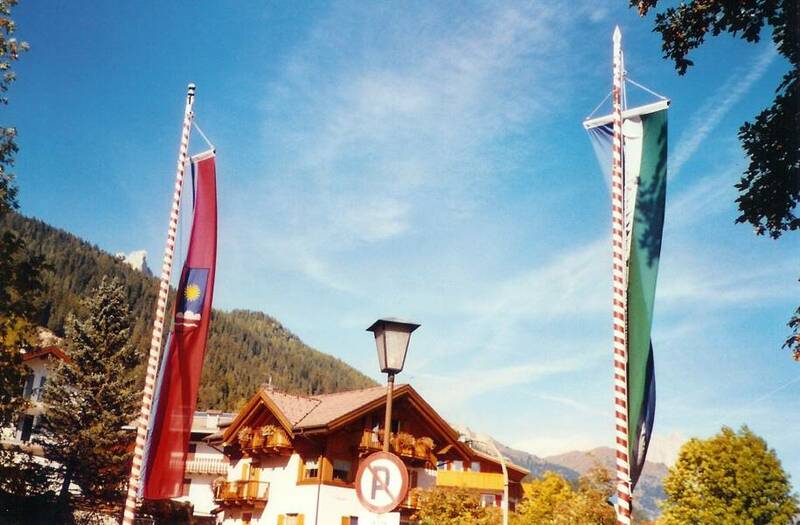 An important flag used in Alto-Adige is the flag of ladin people: horizontal blue-white-green. Sometimes it can be seen with local civic arms on it. Giuseppe Bottasini described the a flag from <www.provincia.bz.it> as "Ladins in South Tyrol, Italy" 2:3 (Vertical 3: lightblue, white, lightgreen). Interesting pattern, no? The austrian tyrolians fly a horizontal tricolor, while the italian tyrolians fly a vertical one .I wander about the different blue shades, though. "Patrje Ladine (Ladins) - North Italy." - Horizontal blue-white-green. few of them in some valleys of Rhetian Alps (Switzerland). Flag similar to Aran (Spain).This flag is listed under number 46 at the chart "Flags of Aspirant Peoples" [eba94]. I found a picture of the Ladin flag flying at the La Usc Di Ladins site which is an online Ladin language journal .The flag can be found at <www.lauscdiladins.com>. About the Ladin flag they told me the following meaning of the colours: The flag symbolizes the landscape: blue for the sky, white for the mountains and green for the meadows. According to <www.vejin.com>, the flag was created in 1920 during a meeting of Ladins. The text also confirms what has already been stated regarding the meaning of the colors of the Ladin flag: blue for the sky, white for the mountains and green for the meadows. According to Gilberto Oneto article published on "ETHNICA popoli e culture" November 1993, the Ladine flag is rapresented with the Grigioni Goat in the white stripe. Grigioni is of course also known as Grischun (Rumantsch), Graubunden (German) or Grisons (French). The goat is more precisely an ibex, whose meaning is explained on Graubünden / Grischun canton (Switzerland). It is stated that, although most Ladins live in Italy, a few of them live in the Rhetian Alps, therefore in Switzerland. I wonder if the flag sent by Marco is not specifically used by those Swiss Ladins. As it looks we can't regard the flag with the ibex as the official Ladine flag. I asked Mateo Taibon, who is the coordinator of the Council for Ladinic Problems (<www.vejin.com> or <tinyurl.com>) and responsible for the Ladine page of the Society for Threatened Peoples (<www.gfbv.it> or <tinyurl.com>). He writes that the information in the ETHNICA journal is wrong, the Ladine flag does have the colours blue, white and green but does not contain an ibex or anything else. Its colours represent the blue sky, the snow covered mountains and the green pastures of "Ladinia". This flag is also showed on the two mentioned websites. He further writes that there are some folkloristic versions on local level but none of them is the official Ladine flag. Maybe the flag with the ibex is such an example. I never saw such a flag in the Grisons canton nor heard about it. Gion A. Derungs from the organization "Lia Rumantscha" (Romansh language) confirmed to me that the "Swiss" Romanshs* (that's how the Ladins call themselves here) don't have an own flag. It's a bit complicated with the terms Ladin and Romansh. "Romansh" can be used as generic term for the "Swiss" Romansh, the Italian Ladinic and the Friulic (Italy) dialects. If you look to the language map of the Grisons canton at <www.liarumantscha.ch> (on that website you find also a Romansh-English dictionnary), you can see that there are also two areas of Ladinic idioms (the white areas are German or Italian speaking). As for the "Swiss" Romanshs, it is correct to say that they speak Romansh (even if they come from the Ladinic sub-areas), but on the other hand, no Italian Ladine would call himself a Romansh, they just use the term Ladine (as far as I can see). *"Swiss" is just meant as an adjective and it's not part of the name. The Romanshs just call themselves and their language "Romansh" or "Rheto-Romansh". During my visit in In Italy, I saw many ladins flags in many shapes. 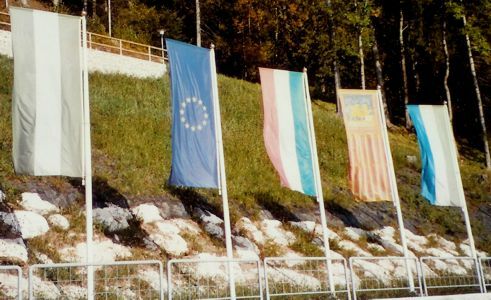 Flags with horizontal stripes near Pso di Costalunga (Trento Province, Trentino-Alto Adige Region) and Cortina d'Ampezzo (Belluno Province, Veneto). 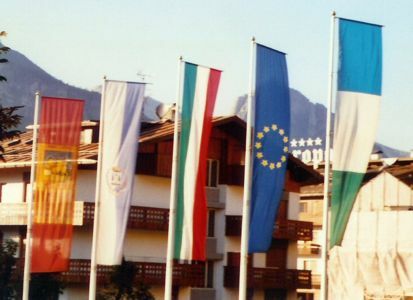 Flags with vertical stripes at Vigo/Vich (Trento Province, Trentino-Alto Adige Region) and .Borca di Cadore (Belluno Province, Veneto). Those of you interested in winter sports might have noticed this morning (19 December) the Ladin flag waved by a supporter during the men's super-g of Alta Badia. The flag was the horizontal version of the Ladin flag. The ski resort of Alta Badia, the Mecca of super-g, is located in Sudtirol, and therefore the Ladin flag was not off-topic. Several members of the Italian national winter sport teams come from Sudtirolian dynasties, as can be guessed from their German-sounding names (for instance the families Plank, Kostner, Moelgg, Huber and Pallhuber). 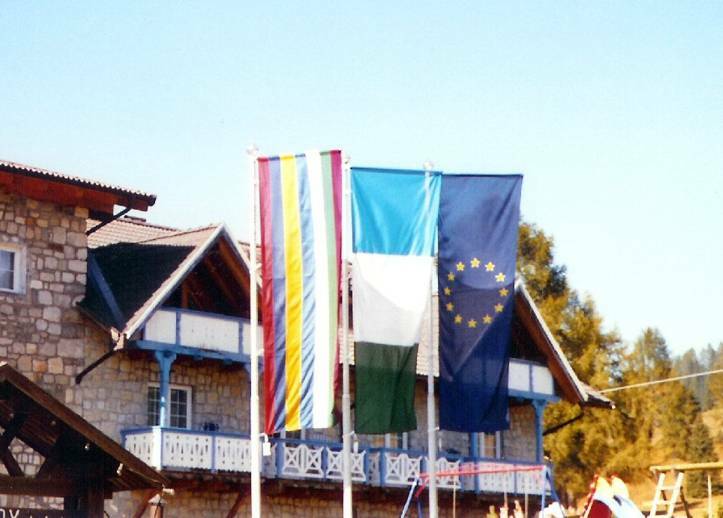 Photo that I have and taken in front of Cësa di Ladins shows a vertical flag of the Ladins, a vertical tricolour of green, white and blue. The most noticeable characteristic of this flag is that the shade of green is very, very dark, nearly black, which differs from the green in the ladin flags we show above. As for the rest, the proportions seem to be close to 2:1 and the blue is light, but not as light as the top image in this page. There are two versions of vertical flags. The other variant is with horizontal stripes. It seems that there is no specifications fro "ladins green" and it is not "nearly black". Compare the Italian green and Ladins green at the photos and you see what I mean. I check all my photos, and it seems that the shade of green in Ladins flag is not consistent, so there is no single "Ladins green".